Where am I? > Home > Travel Insurance Quotes > Medical Travel Insurance > Is grey hair a sign of heart disease? Is grey hair a sign of heart disease? People who are beginning to notice signs of grey hair have more to worry about than their image. That's according to a new study that suggests a link between grey hair and heart disease. Researchers at Cairo University have linked hair whitening to a heightened risk of damage to arteries supplying the heart with blood. They also suggested greying hair has a biological impact on coronary heart disease. These include impaired DNA repair, oxidative stress, inflammation, hormonal changes and the halting of cell growth. Researchers say in the future hair colour could provide an advanced warning as to whether someone was at risk of heart problems. Anyone who has suffered heart problems can arrange specialist medical travel insurance. Experts at the British Heart Foundation however called for more research into any potential link and urged people worried about their heart health to see their GP. More than 500 men who had been suspected of suffering coronary artery disease took part in the study. It found that those with grey hair had arteries that were more damaged. 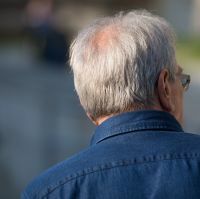 Those with more grey hair had an increased risk of coronary artery disease. Dr Irini Samuel, a cardiologist at Cairo University in Egypt, said: "Atherosclerosis (artery disease) and hair greying occur through similar biological pathways and the incidence of both increases with age. "Our findings suggest that, irrespective of chronological age, hair greying indicates biological age and could be a warning sign of increased cardiovascular risk." Emily Reeve, senior cardiac nurse at the British Heart Foundation, said: "A much larger study is needed before we start using hair colour as a measure of heart disease risk. If you're over 40 and worried about your heart health you should ask your GP for a free health check." The research was presented at EuroPrevent 2017, the annual meeting of the European Association of Preventive Cardiology.